Consumer Guide’s test 2016 Volvo XC90 arrived in top-tier Inscription trim. Equipped with almost every possible option, our test truck came to $66,705, including the destination charge. 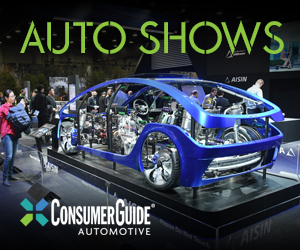 If you’ve read enough Consumer Guide® reviews, you know that our editors are always on alert for expensive options that, if allowed to pile up, can sour the “good deal” value of a given vehicle. The 2016 Volvo XC90 T6 that we drove recently should have set off some alarms, as it came in a top trim level and was abundantly stocked with factory options, but darn it if—to this driver at least—it didn’t feel like it was worth practically every penny. The $5600 Inscription package includes aluminum roof rails, aluminum lower door-sill molding, and Inscription-specific alloy wheels. Consumer Guide’s test truck was fitted with larger-still 21-inch wheels. CG’s sample of Volvo’s new entry in the premium midsize crossover segment had a bottom line of $66,705 delivered. Indeed, the only way the XC90 Inscription that our editors drove could have cost any more is if its Bower & Wilkins premium sound system option had been the version with a CD player, which adds another $150. But considering its high levels of performance, luxury, and technology features, this Volvo genuinely seemed like the kind of prestige-class SUV for which someone might expect to pay that kind of money. Though modestly priced for the class, the Volvo XC90 cabin boasts a cabin that rivals the best from Audi and Mercedes-Benz in terms of materials and assembly quality. XC90 T6 performance is the province of a supercharged and turbocharged 2.0-liter 4-cylinder engine and 8-speed automatic transmission. The engine develops a healthy 316 horsepower and 295 lb-ft of torque that Volvo says will propel it from rest to 60 mph in 6.1 seconds. Four selectable driving modes—“ECO”, “Comfort”, “Off Road”, and “Dynamic”—alter performance of the engine, transmission, suspension, and other systems depending on need. Comfort is the default setting, and this tester did much of his work-commute driving in that mode. However, selecting Dynamic spurs a palpable eagerness from the XC90. Shifting on the go into Dynamic from Comfort, I could see on the tachometer what I was feeling—an instant jump of at least 750 rpm. Throttle response in Dynamic is quicker (yet there’s no extra noise penalty). 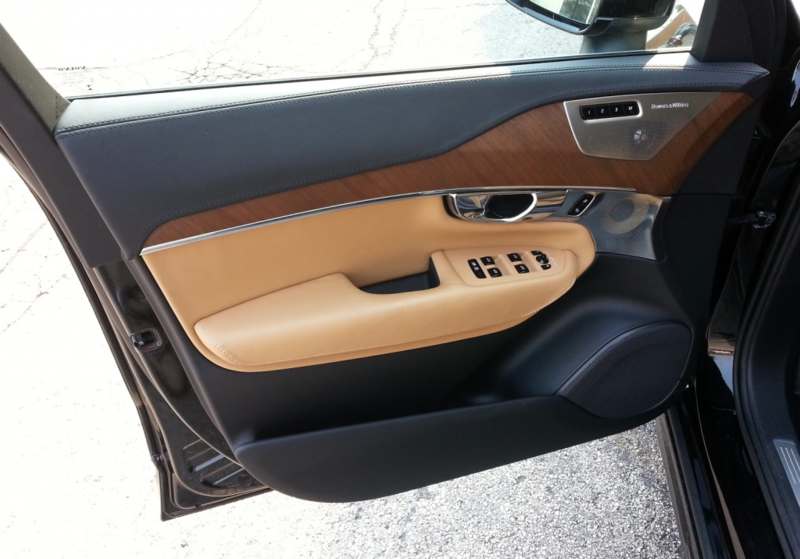 The XC90 cabin incorporates leather, wood, and aluminum trim elements to excellent effect. 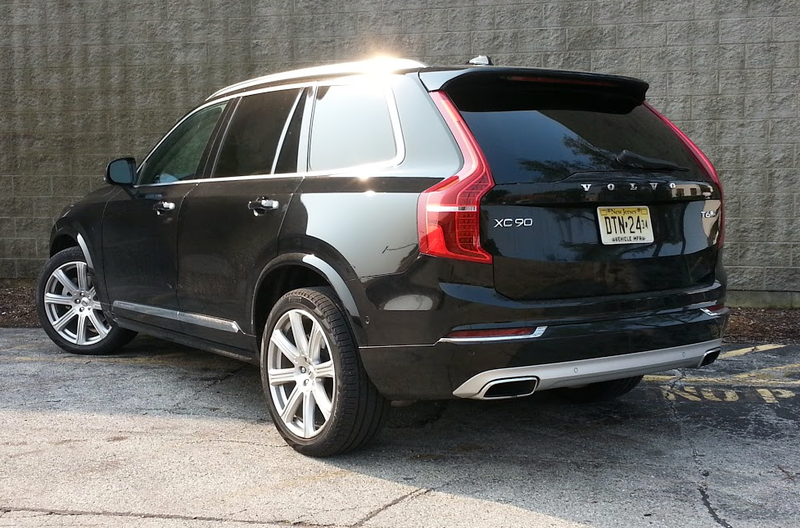 EPA fuel-economy estimates for the XC90 T6 are 20 mpg city, 25 mpg highway, and 22 combined. This driver averaged 19.58 mpg from a test stint of 158.3 miles, 57 percent of that in city conditions. Even in Comfort mode, the ride never gets too spongy, handling is sufficiently responsive for good maneuverability, and braking is prompt if a little abrupt. CG’s test vehicle included the all-wheel air-suspension option that raises or lowers ride height depending on the needs of the various drive modes. 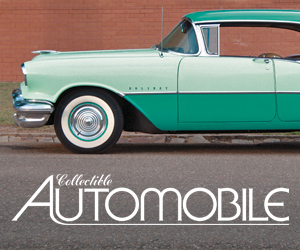 As for luxury, a well-optioned Inscription model has plenty of it. Vibrantly colored and plush standard heated and ventilated front seats feature side bolsters and cushion extenders, both with power adjustment. Soft-to-the-touch surfaces and linear-walnut inlays are generously distributed around the quiet cabin. A panoramic moonroof with power shade, “hands-free” power tailgate, 4-zone electronic climate control, tilt/telescoping steering wheel, integrated aluminum roof rails, and illuminated door-sill plates are among other niceties. The extra-cost Climate Package adds heated rear seats, steering wheel, and windshield-washer nozzles. The XC90 is a 3-row, 7-seat vehicle. Passengers will find generous room in front, and very good space in the 2nd row—where 3 adults can squeeze in but the middle passenger won’t have to endure the pity of his neighbors. Second-row seats adjust fore and aft, and for seat-back angle. The 3rd row may serve a couple of smaller adults (if the ride doesn’t last too long) but will probably be just fine for the younger set. 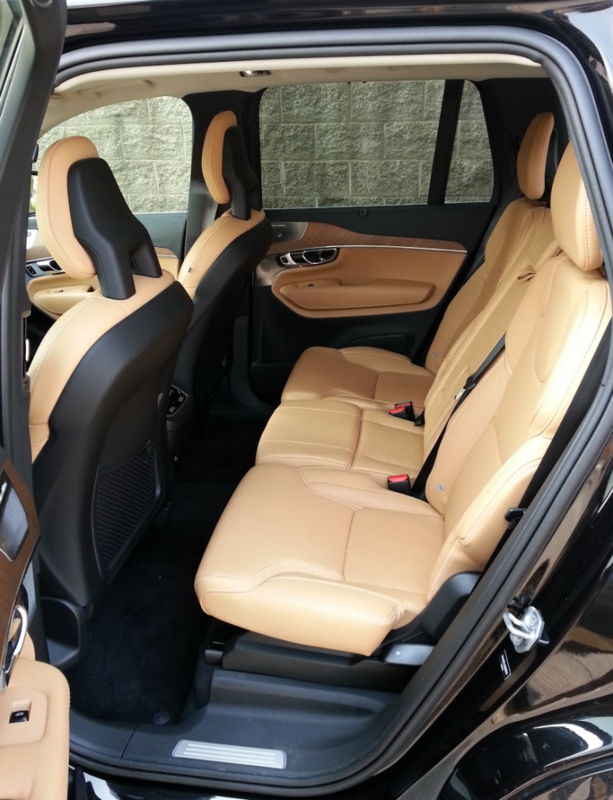 There’s ample head- and legroom for adults in the XC90’s second row. There’s fine personal-storage availability throughout—even 3rd-row riders each get a cup holder and a small covered bin in the side walls. Luggage space is large with the 3rd-row seats down, which forms an unbroken flat floor. Second-row 40/20/40 seats fold flat, too, but leave a slight gap between them and the cargo floor. A small underfloor space is available in back, and a number of tie-down hooks are available for securing cargo. Straight-back and over-the-shoulder visibility is quite good. B-pillars are pretty thick, though, so there’s a significant blot to the sides. 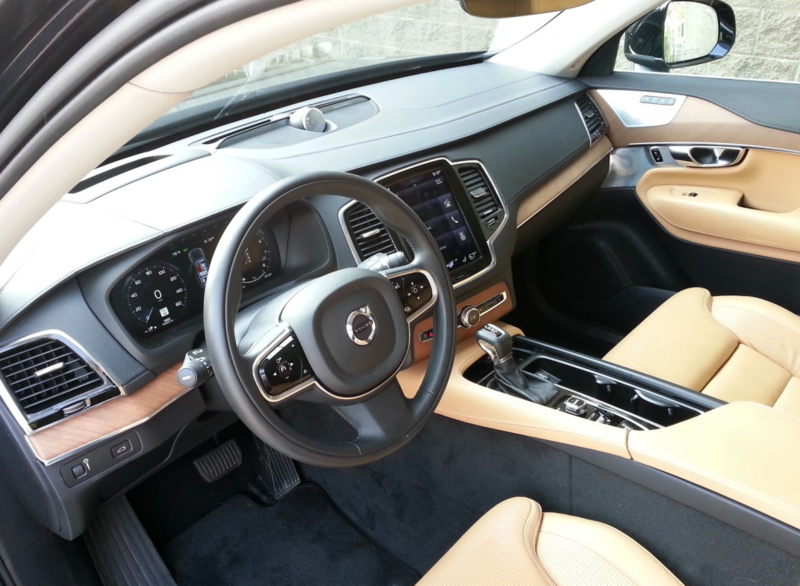 Other standard electronics include Volvo On-Call emergency notification, a 10-speaker audio system, satellite radio, Bluetooth connectivity, pedestrian and cyclist warning/braking system, lane-departure warning, rearview camera, and rear parking assist. 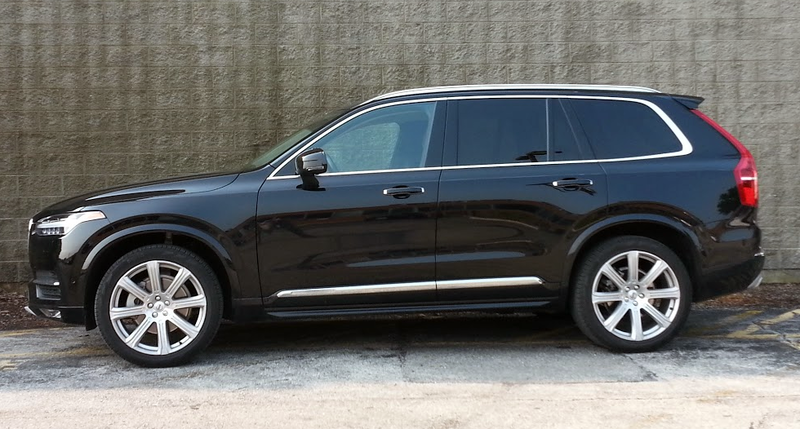 Optional tech features include blind-spot and cross-traffic alerts, a 360-degree proximity camera, “Park Assist Pilot” that automatically steers into stall-type spaces, and “Pilot Assist” adaptive cruise control that will automatically mimic the speed and steering of a vehicle in front of the XC90 at speeds below 30 mph. Controls are generally easy to reach and use. The driver is confronted by a large, legible vehicle-information display between the 2 main gauges. The driving modes are summoned by rotating a little drum selector on the console to desired setting (displayed on the touch screen) and then pressing the drum. All told, there’s a lot of comfort and capability built into this new Volvo sport-utility—and the one we drove topped the list of the cars with the T6 powerplant (a more powerful and costlier T8 hybrid is available). That means there are ways to tap into its essential virtues for less and still get your money’s worth. 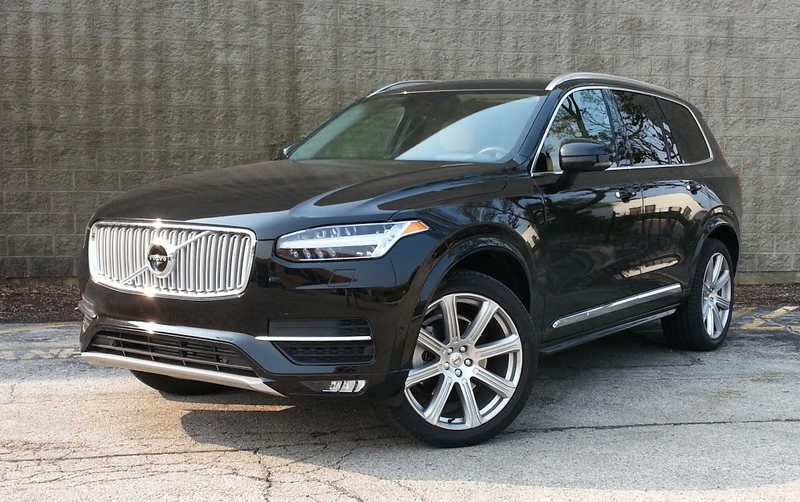 The XC90’s 2.0-liter engine is both turbocharged and supercharged. The result is robust acceleration with virtually no low-speed turbo lag. Written by: The Daily Drive staff on September 2, 2015.on March 22, 2019.